The Best 50 Years: Almost Ready for Christmas! I have been ahead of the game on birthdays all year and do have several Christmas gifts in reserve - my buying frenzy last winter has really paid off! Plus, not only have I decreased my stress level this fall, I also saved a ton of money. Buying things online that were super on sale is definitely the way to go! But with some items, I still have to figure out exactly who gets what. I've got lots of kids on my list and bought a dozen or so games and just need to allocate them by age/interest, but that won't be too hard. 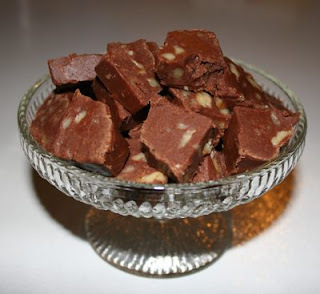 I also need to decide whether I'm making fudge for Christmas gifts this year, and if so, I need to do it soon. I discovered years ago that I can make it ahead of time and then freeze it with great results, which saves all the last-minute stress of giving a homemade treat. I just cut it to size, double wrap it in plastic food wrap and pop it in the freezer where it won't get buried or dinged up. When it comes time to wrap it, I pull out what I need and pop it in the appropriate box and voila! Instant gift! So...are YOU almost ready for Christmas? Homemade Cooler - No Electricity or Ice Required! Impossible Beyond This Point Book Almost Done!